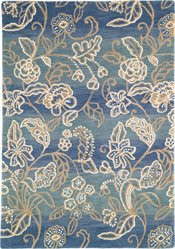 Upholstery: The best advise here is don't scrimp on the construction buy the best that you can afford . You will be thankful 2 years down the road when your couch is still in one piece. Expect that your furniture will be jumped on, drawn on, spilled on, and shedded on. Pick out styles that are simple. Try to go with legs not skirts- skirts will just get covered in dog hair and chewed on. I think that slipcovers are one of the best routed that you can go for your upholstered furniture. There are so many great companies that have fitted slipcovers that are not messy looking. Another company that has beautiful slipcover upholstery is JM Paquet http://.jmpaquet.biz/ Pottery barn has some great slipcover sofas and chairs at great price points. Custom made slipcovers are a option for that well made sofa that will not die, but has a tired look. Once again there are a variety of fabrics to choose from you will need approx 12-18 yds. of fabric to do a sofa. Don't forget the details cording and welting in contrasting colors they add a lot. When looking for fabrics try to find cottons. I find that denim is a great fabric to use it will last and it washes will. 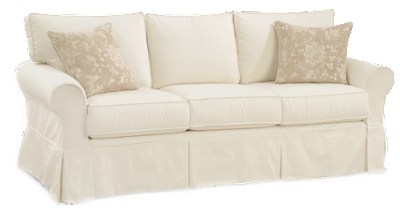 Recommended care for your slipcover is dry cleaning. If you decide to go with a regular upholstered piece you can order another set of cushion covers at a minimal costs you will have a lot longer life and not worry about that stray marker. Case Goods: Can't say storage, storage, storage too many times. Put the toys away there is no need to look like you walked into a day care. Find pieces that are distressed, stay away from the antiques. Like upholstery it will get abuse and the distressing really hides a lot. Coffee table options: Ottomans are wonderful for family rooms to use as coffee tables they are great storage pieces with flip up covers and it is nice when the kids are little ad pulling up on everything stage-no sharp corners. They are also great for additional seating. Add a tray to put a items on it is easy to get stuff out of the way when you need access. I also like the look of large old wicker trunks as coffee tables they offer great storage options just be sure they are not painted with lead paint. Dressers are another way to incorporate storage into your family room it gives a great space for accessories and a lamp. Used Dressers are easy to find add a coat of paint and cool hardware and you have a great piece not costing alot. TV cabinets or TV consoles work wonderfully to keep things out of reach for exploring hands plus it is nice to close all the cords and mess away behind doors. Paint is a low cost home improvement just getting color on the walls is sometimes all you need to help revive a room. Maybe do a accent wall with a different color paint. The best paint to use is a eggshell or satin it is easy to wipe off. Wallpaper: I love to give your room a graphic punch that it needs you only need to do one wall. 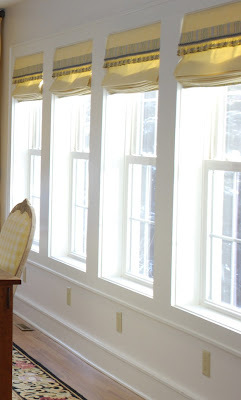 Window treatments: bring warmth to a room. It is all about layering and you can do it in stages. Start with a roman shade then down the road add a fun valance. When the kids are older add panels to give it a more grown up feel. Avoid panels and puddling drapes when the kids are little you will just have disaster. Make sure you don't forget fun trim or details to make it look special . When looking at roman shades or blinds for try to find continues loop mechanisms it will avoid cords hanging down and being a danger to your little ones. DO Accessorize! 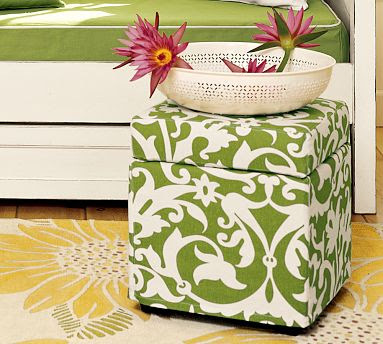 : Nothing makes your home yours like accessories. Just because you have kids it is not a reason you can't accessories. Anything that is 45" off the floor is a safe zone for your items. Mantels are great areas to accessorize and on top of higher case goods. Add mirrors and Art work to your walls you don't have to spends a lot. Baskets are a great way to store toys and looks great. A fun project take some black and white pictures of your children. Pick a matt color that works for your color scheme and add a frame if you group these together on the wall with the same frame it is a visual impact. I am working with a 10 x 10 photo with pink and green matting in a 20 x20 frame. The larger negative space with the matt is a great look. When decorating with photos try to have matching frames or have all the frames in the same finish. I have a chair I love by JM Paquet. Sadly, it hasn't survived the puppy and my two-and-a-half yeat old toddler. One leg is in need of repair. The worst part is that the dog ate a small piece, 2" square of the slipcover from the arm rest. Any thoughts on repairing the chair and mending the slipcover? How would I go about replacing the slipcover? I am in Ithaca, NY.